UK author and broadcaster Paul Mason sees the future as a place where the value of work is reduced to zero, but ideas — and their proliferation — still hold sway. I interviewed Paul for Publishing Perspectives in the run up to the Frankfurt Book Fair last month and this is what he had to say…. 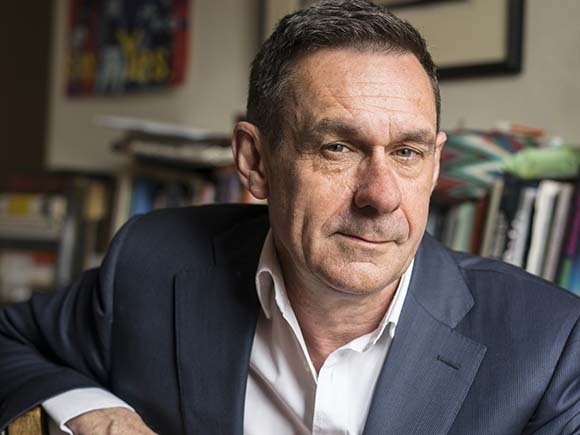 “I don’t think publishing has mastered digital,” laughs journalist — or prophet — Paul Mason, author of Postcapitalism: A Guide to our Future, responding to the thought that publishing has entered a post-digital age, as some at the fair will be claiming. “The digital world is in a permanent revolution and all they have mastered is how to produce digital files that approximate to what a book used to do. “The reproduction cost of an information file — whether an ebook, the design of an airliner, or NASA’s model of the earth’s climate — is close to zero. And only the monopolization of information and aggressive imposition of IP law is now stopping the price of information falling to zero. When it does the relationship between information and ownership, work and wages that has underpinned capitalism will be over. PostcapitalizmIf you haven’t heard of him already, award winning journalist Paul Mason is the economics editor of Channel 4 News in the UK, a prestigious hour-long news program shown most nights of the week in the UK; a columnist for The Guardian; and author of several books including Meltdown: The End of the Age of Greed, the groundbreaking Why It’s Kicking Off Everywhere, and now Postcapitalism published by Allen Lane, part of Penguin Random House, which he wrote amidst getting hit in the head by a CS gas canister in Gezi Park, Istanbul, and reporting on the Gaza war and from the periphery of the Ukraine crisis. He has also published a novel and has another in the works. “Postcapitalism” is a term that pre-dates Mason’s attempt at reinventing Marxism for the digital era, and usually refers to the proposed new economic systems that might follow the end of capitalism. And ever since the end of the dot com boom Mason has been grappling with the problem of what is going to happen to capitalism as the silicon chip and the Internet of Things lead to the rise of machines that can reproduce things more or less for free, and to the growing rejection of private ownership in favor of shared ownership models and the networked individual. While this anger and frustration might seem far away from the hustle and bustle of the trade halls and packed cafés of the Frankfurt Book Fair, Mason thinks this sense of prosperity and growth is a mirage — dig deeper and capitalism is dying, its golden age long gone. And if you think he is arguing that Silicon Valley has inadvertently reinvented socialism — he is. For Mason, this isn’t just wishful thinking: the revolution has already started but we might just have not noticed it. “Now the revolution against the system is already taking place mentally: large swathes of people are switched off, alienated by the pretend morality of the elite, and live a life as mentally rebellious as the vernacular printed Bible readers did in the 15th century. It’s no coincidence, he thinks, that we are all obsessed with fantasy, other-world dramas like Game of Thrones. As to whether the Frankfurt Book Fair will survive another 500 years — he is rather doubtful.